This webpage offers ASTSWMO members, States, and Territories a dedicated, centralized resource hub for information and tools related to the reduction, recovery, and recycling of wasted food. It provides information on wasted food reduction and recovery efforts as well as existing legislation. In addition, this page also links to varied tools and resources for promoting the reduction of wasted food in your State or Territory. In 2012, the Natural Resources Defense Council (NRDC) published a groundbreaking report that revealed that up to 40% of food in the United States goes uneaten. (Wasted: How America Is Losing Up To 40% of Its Food) Meanwhile, one in seven Americans is food insecure. (ReFED, 2016) This represents a large loss of valuable resources spent growing, processing, transporting, and disposing of food that was never eaten. According to one estimate, 25% of all freshwater supplies is used to grow food that ends up wasted. From farm to fork to landfill, food represents 14% of our total domestic greenhouse gas emissions. This is why reducing wasted food has been identified as the third most important strategy to reduce global warming by Drawdown. Recognizing the importance of wasted food and food scraps on both people and the environment, the EPA announced A Call to Action by Stakeholders, seeking to work with communities, organizations, business, and government to reduce food loss and waste in the U.S. by 50% by 2030. 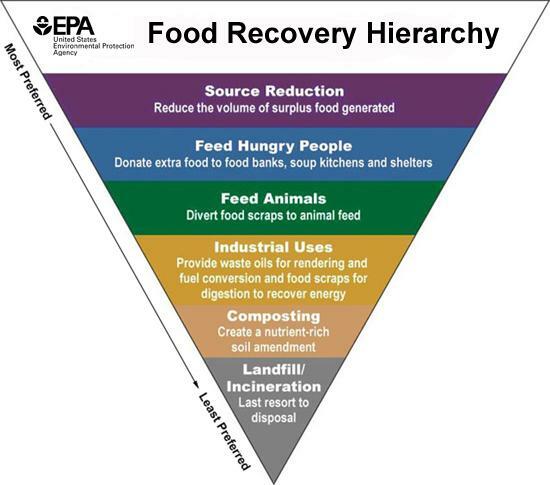 With the development of the Food Recovery Hierarchy, organizations can prioritize actions to prevent and divert wasted food. The top levels prioritize waste prevention strategies, followed by food recovery, food scraps recycling, and finally, disposal as a last resort. “Wasted Food” VS. “Food Waste” – A terminology swap can influence how an issue is perceived, and how it is best measured and approached. The term “food waste” generally refers to only a piece of the larger issue, covering the disposal (or diversion) of the material. “Wasted food” calls attention to all the edible food that is uneaten, as well as the wasted resources and nutrients accompanying the full food chain, and the opportunities to prevent this waste. Various terminology is used to describe methods of preventing or diverting wasted food or food waste. This terminology can include terms such as reduction, recovery, rescue, and recycling. Food rescue, also referred to as food recovery, is the practice of collecting edible food from places such as restaurants or grocery stores and distributing it to food programs for feeding people or animals rather than letting it go to waste. The term recycling is used to refer to various types of end uses for food waste other than disposal in a landfill. This can include composting, anaerobic digestion or other reuse options. This section targets States, Territories, and communities that do not presently have any legislation, regulations, or enforcement influence for the reduction, recovery, and recycling of waste food and food scraps. These campaigns and tools are intended to be easily adapted or replicated. Highest on the hierarchy, reducing wasted food will reduce wasted energy, water, and resources required to produce and distribute food. EPA’s Food Too Good to Waste Campaign: Residential focus – The FTGTW campaign consists of an implementation guide and toolkit that aim to eliminate wasteful food management practices. It is intended to be used by local governments and communities that wish to reduce wasted food in their community starting with the largest generators of food waste: households. EPA also has a database of wasted food programs across the United States, by EPA region. EPA’s Sustainable Materials Management Web Academy – Free webinar series for SMM topics, including wasted food and composting. For example, check out the July 12, 2018 webinar. Further with Food – The Further with Food website provides comprehensive information about food loss and waste in the United States and about solutions dedicated to reducing it. This virtual resource center offers a broad spectrum of users – such as businesses, government entities, investors, NGOs, academics, and individuals —a platform to find and share information about proven solutions and innovative new approaches to reduce the volume of surplus food generated, feed hungry people, and divert food and scraps to the highest beneficial use. NRDC: Natural Resources Defense Council – NRDC’s website acts as a clearinghouse for information on the national food waste issue and connects and educations people about viable solutions. They work with policy makers, industry, and consumers to reduce wasted food across the country. ReFED: Rethinking Food Waste Through Economics and Data – ReFED is a collaboration of over 30 business, nonprofit, foundation and government leaders committed to reducing food waste in the United States. It was formed in early 2015 to create a Roadmap to Reduce U.S. Food Waste by 20 Percent, the first ever national economic study and action plan driven by a multi-stakeholder group committed to tackling food waste at scale. The full Roadmap report along with the Retail Food Waste Action Guide, Foundation Action Guide, Restaurant Food Waste Action Guide and Foodservice Food Waste Action Guide can be downloaded from their website. World Wildlife Fund – WWF works with partners to feed the world while conserving the earth’s precious natural resources by improving efficiency and productivity while reducing waste and shifting consumption patterns. Food Recovery Network – The Food Recovery Network is the largest student movement against food waste and hunger in America. As a national network of college students, food businesses, and hunger-fighting nonprofits, they connect food-insecure communities with surplus food. The movement began at the University of Maryland in 2011, and in five years grew into a national network of 230 chapters in 44 States. NRDC and the City of Denver, CO – These two groups have teamed up to address food waste in the City of Denver. The Food Action Plan aims to reduce the number of food insecure households by 55% and cut the volume of food waste in residential garbage collection by 57% citywide by 2030. Harvard Food Law and Policy Clinic (FLPC) and Racing Horse Productions on Date Labeling – Along with guidance from the Harvard Food Law Lab, this group released the short film “EXPIRED? Food Waste in America” in 2016 to show how misleading date labels on food products contribute to food waste in America. Pacific Coast Collaborative – The PCC connects west coast jurisdictions regionally and facilitates collaboration on cross-border issues, sharing policy and technical expertise as well as strategies to curb greenhouse gas emissions. PCC partners have recently committed to a regional goal of halving food waste by 2030 and will focus on broader engagement and leadership from industry across the supply chain in addition to policy actions at the local, State and provincial level. The commitment and strategies are detailed in this policy briefing. The following includes ways to promote wasted food donation as food rescue for people and/or animals. Feeding America – Feeding America works with manufacturers, distributors, retailers, foodservice companies and farmers to divert and gather food before it goes to waste. The diverted food is sent to their national network of 200 food banks and 60,000 food pantries and meal programs so it can feed children, seniors and families who need it the most. Food Rescue Alliance – The FRA is a Peer Learning Network for emerging innovative food rescue organizations to be able to share information, ideas, projects, values, and create an overall collaboration between people developing innovative models of food recovery in the country. FRA is a project of the Boulder Food Rescue. Reducing Food Waste in Businesses – Develop guides and consider providing technical assistance to businesses looking to reduce food waste and/or recycle. This can be performed by government entities, but could also be contracted through your agency. Examples: Oregon Metro provides guidance page for business to reduce food waste; Massachusetts DEP partners to create RecyclingWorks to assist businesses and institutions with reduction, donation, and recycling; New York DEC contracts with the Pollution Prevention Institute to provide direct technical assistance for businesses generating food waste. Sustainable America – Sustainable America is a non-profit organization with the mission to make the nation’s food and fuel systems more efficient and resilient. It was founded in 2012 to focus national attention on the vulnerable state of our food and fuel systems with the mission to reach two important goals by 2035: increase food availability by 50% and reduce oil consumption by 50%. At their website you can find the Food Rescue Locator, a directory of organizations across the United States that rescue, glean, transport, prepare, and distribute food to the needy in their communities. You can search by zip code for the food recovery organizations operating in your area within a 5 to 100- mile radius. Food Banks – Partnering with food banks and emergency feeding operations in your area. Feeding America updates a nationwide network of food banks and surveys them periodically. Localities can assist food banks with creating partnerships and links to local groceries and other surplus food supplies. Food Safety Information – Work with your local health department (or equivalent statewide agency) to develop food handling safety guidelines for donated foods. Examples: Washington State Charity Food Donations guidelines; San Diego County’s Safe Food Handling for Donation checklist; Feeding America’s food donation guidelines; Vermont DEC Guidance for Food Donation targeted at businesses and institutions. Harvard Food Law & Policy Clinic – This group has experience partnering with State agencies and local governments to clearly explain and reference rules and regulations related to the food safety system. They operate as legal consultants as well as a “translator to laymen’s terms” for current policies impacting various stakeholders. Examples of their past and current projects include developing a best practices document for Food Policy Councils and creating fact sheets surrounding the policies associated with food waste and donation initiatives (e.g., expiration dates, federal Good Samaritan Law, tax deductions for donation, etc.). Food Cowboy – Food Cowboy Foundation’s mission is to help food companies, charities, consumers and entrepreneurs collaborate to reduce hunger and protect the environment by reducing food waste. The Foundation promotes the highest use of wholesome unmarketable food and reduces hunger and waste by using technology, social media and strategic investment to help bridge the logistics gap and economics hurdles that result in food waste. Swine Feeding – Some states and local governments prohibit the feeding of food that has come in contact with meat to swine, cattle, or poultry. Examples: New York State Department of Agriculture and Markets Garbage Feeding guidance; FDA’s Ruminant Feed Ban Rule. Consider working with your State agricultural agency to develop guidance on feeding wasted food to animals/livestock. Composting Council Research and Education Foundation – CCREF, a 501(c)(3) charitable foundation, was incorporated on June 9, 1992. The CCREF supports public and private research and education activities and initiatives that enhance the stature and practices of the composting industry to advance environmentally and economically sustainable organics recycling. CCREF is affiliated with the USCC but is its own entity and financials and funding are separate. EPA Anaerobic Digestion Facilities Survey – EPA surveyed operators of AD facilities that accept food waste about their operations in the calendar year 2015. A report was published on the findings and summarizes three types of AD facilities: standalone food waste digesters, on-farm digesters co-digesting food waste, and digesters at water resource recovery facilities that co-digest food waste. The EPA report was among the topics addressed during the Anaerobic Digestion session at the October 2018 ASTSWMO Annual Meeting. Check out the webinar of the session. US Composting Council (USCC) – International Compost Awareness Week is a nationwide education initiative for organics recycling and compost use. Many States have created their own awareness week alongside the USCC. Also, the Seal of Testing Assurance Program provides testing and labeling of compost products to ensure they meet quality standards. Composting at Schools – Many States have developed guidance written specifically for organics recycling at K-12 schools. Examples include: Connecticut DEEP School Composting manual; USCC page includes links to multiple successful programs and lesson plans. Teton County, WY and Grand Teton National Park with Subaru – In association with the National Parks Zero Landfill Initiative, the park and municipality have partnered to pilot an in-vessel compost system within the park as part of a national program pioneered by Subaru. Several States adopted legislation or rules that require food waste to be diverted from disposal. Disposal bans are used in 4 New England States: CT and RI require larger generators to divert food waste from disposal if located within a specified distance of a composting of AD facility; MA also requires larger generators to divert food waste from disposal regardless of distance to an organics processing facility; VT law is phased over time, targeting larger generators first, and will require all generators of food waste to divert by 2020. CA uses a different approach by requiring certain reductions in GHG emissions by diverting food waste from landfills. Some of these State programs also include provisions that incentivized reduction of food waste (such as mandated Pay As You Throw) and reference a hierarchy for managing wasted food and food waste. An excellent source when searching for food system policies currently in place is the ReFED United States Food Waste Policy Finder web app. This is a search engine that lists policies related to date labeling regulations, donation liability protections, donation tax incentives, animal feed regulations, and organic waste bans and waste recycling laws. This database was put together by the Harvard Food Law and Policy Clinic in partnership with the Natural Resources Defense Council and the University of Arkansas School of Law. The following links and information present Statewide food waste reduction, recovery, and recycling laws and regulations. The following links and information present federal legislative initiatives. Some States also provide liability protection for food donation (e.g., Washington). The following links and information present laws and regulations developed by counties, cities, towns, or villages. The following links and information present a sampling of international initiatives in wasted food.